Once you found the list you were looking for, select the list(s) you need by checking the corresponding check-boxes in the left. Then select Journaling in the drop-down menu Actions, and click Apply. 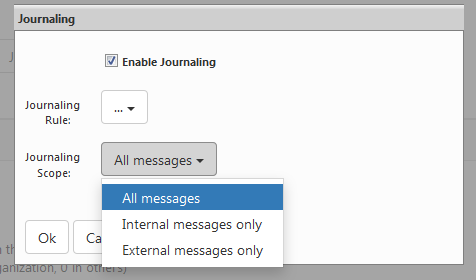 In the new window check Enable Journaling, select a Journaling Rule to apply, decide whether you want to journal all messages, or only internal / external, and then click Ok.
To disable journaling simply un-check Enable Journaling check-box and click Ok.